Dreamworks SKG, Joe Gibbs Racing, The Home Depot, Interstate Batteries and Action Performance Companies Inc. today announced details regarding a special race program featuring characters from the upcoming movie, Shrek 2. The film is the sequel to the 2001 Academy Award�-winning animated blockbuster Shrek, which will reunite the voice talents of Mike Myers, Eddie Murphy and Cameron Diaz, and will be released in theaters nationwide on May 21, 2004. Shrek 2 will be showcased on race cars driven by NASCAR champions and Joe Gibbs Racing teammates Bobby Labonte and Tony Stewart. Stewart and Shrek will kick off the action aboard the No. 20 The Home Depot Chevrolet during the first-ever NASCAR NEXTEL All-Star Challenge (formerly The Winston) on May 22, 2004 in Concord, N.C.
"Paint schemes usually present a fun change of pace, not only for the team, but for the fans as well," Stewart said. "With all of the attention that the first Shrek movie received, the Shrek 2 paint scheme will surely be a big hit with fans." Later, Shrek and all his palsDonkey, Princess Fiona and the new Puss in Boots characterwill team with Labonte aboard the No. 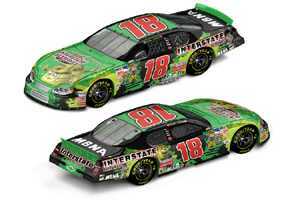 18 Interstate Batteries Chevrolet to see if they can handle the journey through NASCARs 600-mile marathon race, also in Concord, N.C.
"Shrek is a terrific franchise," noted Dave Alpern, vice president of marketing for Joe Gibbs Racing. "This will be one of the larger promotions weve been a part of. It will be fun to see Shrek and Donkeys faces at 185 mph." Labonte added: "Im excited to be running the Shrek 2 paint scheme in May. My family and I really enjoyed the first movie and cant wait to see the second one when it comes out on May 21. I know Shrek won the first Academy Award for animation. Hopefully, Shrek 2 will win an another Academy Award, and I can win with Shrek aboard." Action Performance, the leader in the design, promotion, marketing and distribution of licensed motorsports merchandise, will produce the commemorative die-cast replicas of the No. 18 Interstate Batteries/Shrek 2 and No. 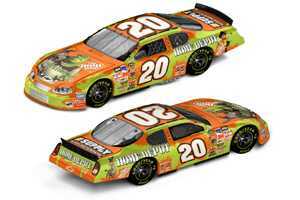 20 The Home Depot/Shrek 2 Chevrolet race cars. The collectibles and other race-related Shrek 2 memorabilia will be available through Actions usual distribution channels, including the 18-member ARC distributor network and the exclusive RCCA collector club. To locate an ARC distributor, please call 1-800-411-8404. To join RCCA, call 1-800-952-0708 or visit www.goracing.com. "Shrek was an animated spectacle when it debuted in 2001," said Fred Wagenhals, Actions chairman, president and CEO. "The films energy and comedy proved entertaining for people of all ages. Now, Shrek 2 promises even more adventures and laughs for everyone. In a way, the NASCAR NEXTEL All-Star Challenge also is entertaining for fans, both young and old. As a non-points event, it provides a great platform for paint scheme specials and a showcase of pure racing talent that simply is fun to watch. Then, fans will get to see Shrek and his crew in action again during the Coca-Cola 600 race. I guess we will see what sort of edge Shrek and his friends can give Bobby Labonte and Tony Stewart once they all climb aboard."